Adding user SFTP access to a Linux system is often required and therefore a must for multi users or web hosting environments it is an absolute requirement to have SFTP user space separation ( isolation ) out of the basic Linux system environment this is done using a fake CHROOT Jail. Purpose of this article is to show how to create SFTP Chroot JAIL in few easy configurations. By isolating each user into his own space you will protect the users to not eventually steal or mistakenly leak information such as user credentials / passwords etc. Besides that it is useful to restrict the User to his own File / Web Space to have granted only access to Secure FTP (SFTP) only and not SSH login access and togheter with the chroot jail environment to protect your server from being attempted to be hacked (rooted / exploited) through some (0day) zero-day kernel 1337 vulnerability. 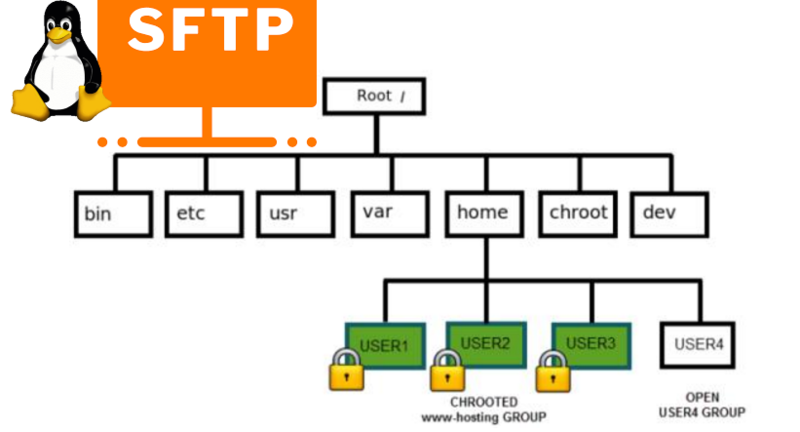 To achieve SFTP only CHROOT Jail environment you need some UNIX accounts new group created such as sftpgroup and use it to assign proper ownership / permissions to newly added SFTP restricted accounts. For each new created uesr (in this case sftp-account1) make sure the permissions are properly set to make the files readable only by the respective user. This short guide was based on documentation on Arch Linux's wiki SFTP chroot you can check it here. This entry was posted on Monday, December 3rd, 2018 at 4:32 pm	and is filed under Computer Security, Linux. You can follow any responses to this entry through the RSS 2.0 feed. You can leave a response, or trackback from your own site.